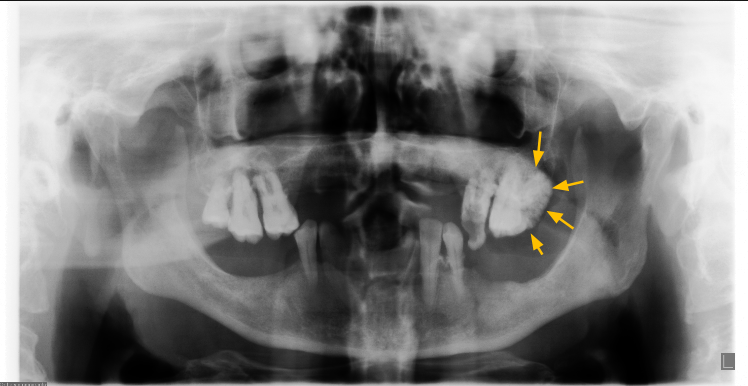 Klestadt (nasolabial) cyst is a rare non-odontogenic cyst in the soft tissue seen in the nasolabial region. It is often asymptomatic and may be seen incidentally. However, there may be pain when the cyst is infected or impinges on adjacent structures. The cyst is usually evident as an extra- osseous swelling in the region of the nasolabial fold. 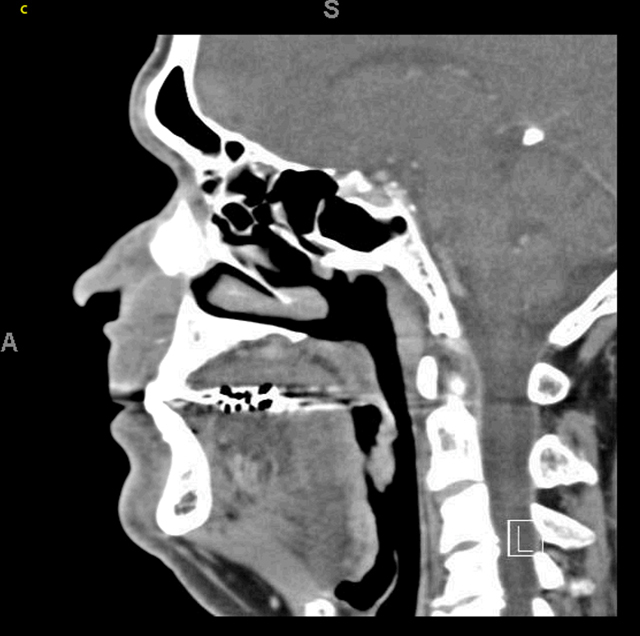 Here we report a case of a Klestadt/Nasolabial cyst in a 52-year-old Caucasoid male who presented with a history of left nasal swelling and pain. 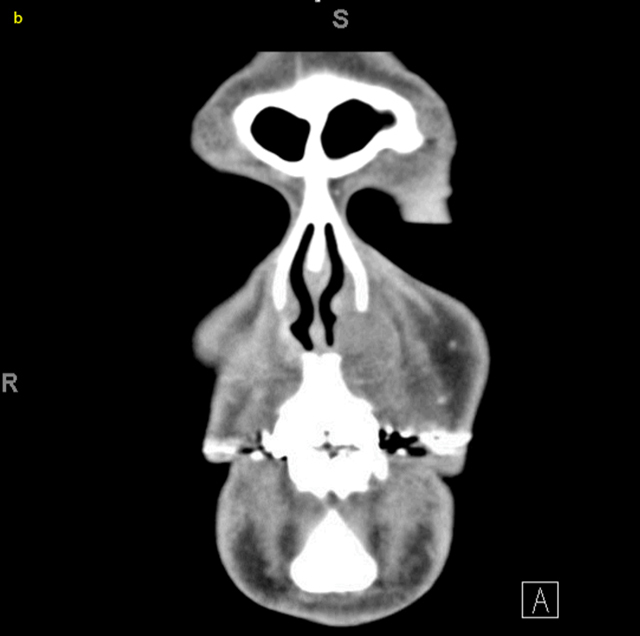 Computed Tomography (CT) images revealed a well-demarcated thin- walled round lesion with intermediate density, measuring about 22 x 18 x 19 mm, in the soft tissue region of the left posterior lateral nasal wall and the nasolabial fold. 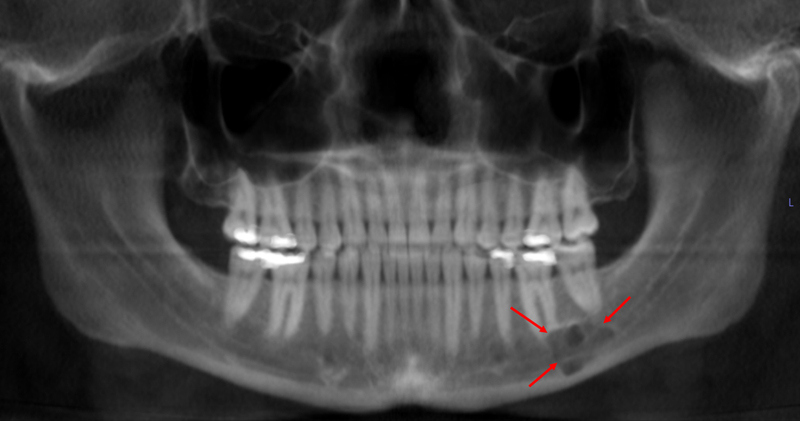 The lesion encroached into the left nasal vestibule with evidence of bony erosion/ blunting of the frontal process of the maxilla. 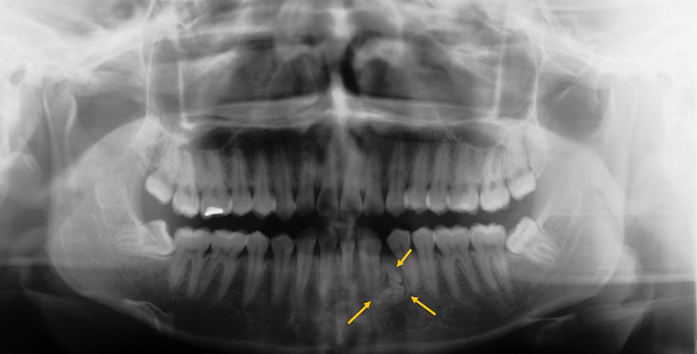 Klestadt (nasolabial) cyst is a rare non-odontogenic cyst in the soft tissue seen close to the nasolabial region. It is often asymptomatic and may be seen incidentally or it may be evident as an extra-osseous swelling in the region of the nasolabial fold. However, there may be pain associated with it when the cyst is infected or impinges on adjacent structures. The cyst when sufficiently large may impinge on the bone and may secondarily cause an effect on the bone. Nasolabial cysts were first described by Zuckerkandl in 1882 (1) and are often referred to as Klestadt cyst after his extensive study on nasolabial cysts when he published in 1953 about Nasal cysts and facial cleft cysts (2). These cysts are more common in fourth and fifth decades in females (3, 4, 5). Nasolabial cysts are mostly unilateral but there have been several instances of bilateral nasolabial cysts. 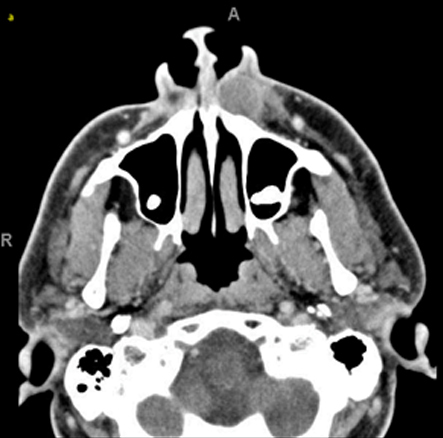 In the literature nasolabial cysts have also been referred to as nasoalveolar cyst, nasal vestibular cyst, nasal wing cyst, maxillary cyst, subalar cyst and mucoid cyst of the nose (6, 7). 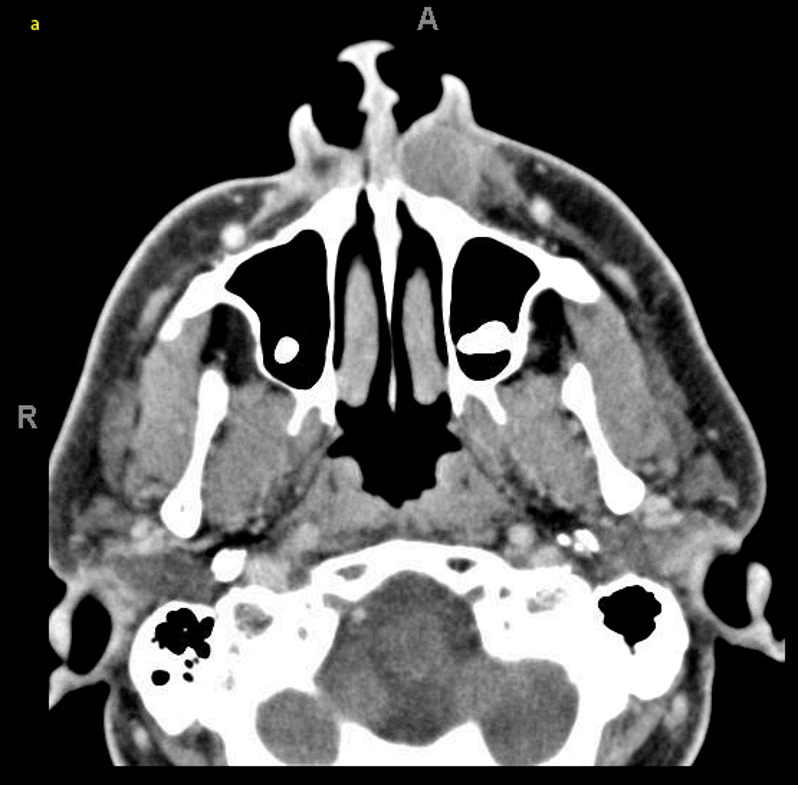 A 52-year-old Caucasoid male presented with a history of left nasal swelling and pain. The swelling had become progressively larger and tender prior to the visit in the emergency department. 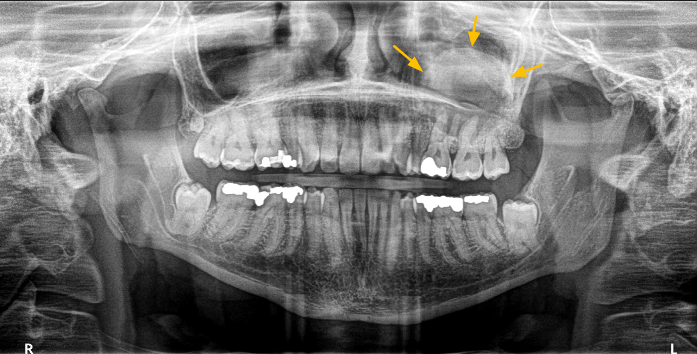 He had a history of dentigerous cysts that were removed at the time of extraction of the third molars, and a sebaceous cyst in the right side of the face. Otherwise the history was unremarkable. 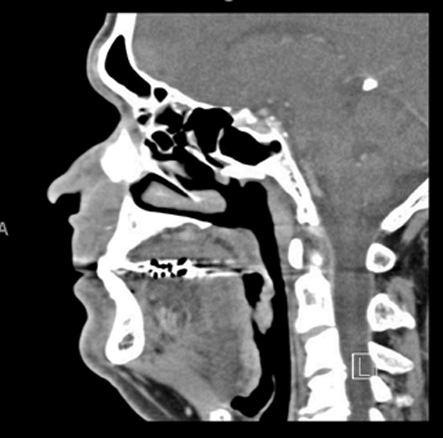 Computed Tomography (CT) images revealed a well-demarcated, well-defined, thin walled lesion having a circular appearance with intermediate density, measuring about 22 x 18 x 19 mm, in its largest dimensions in the soft tissue region of the left posterior lateral nasal wall and the nasolabial fold. The lesion encroached into the left nasal vestibule with evidence of bony erosion/blunting of the frontal process of the maxilla. 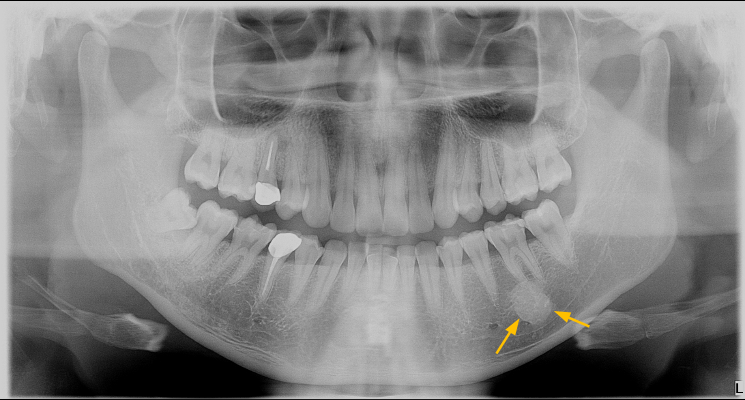 The cyst was enucleated under local anesthesia with an intraoral approach preserving the maxillary bone. No post-operative complications were reported. 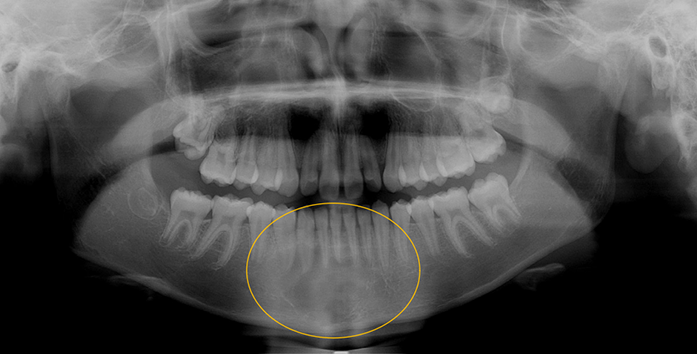 Klestadt cysts are rare non-odontogenic cysts in the soft tissue seen close to the nasolabial fold region. Most of these cysts are asymptomatic and may be seen incidentally or it may be evident as an extra-osseous swelling in the region of the nasolabial fold. However, there may be pain when the cyst is infected or impinges on adjacent structures. The cyst when sufficiently large may impinge on the bone and may secondarily cause erosion of the underlying bone. Nasolabial cysts were first described by Zuckerkandl in 1882 (1) and are often referred to as Klestadt cyst after his extensive study on nasolabial cysts when he published in 1953 about Nasal cysts and facial cleft cysts (2). 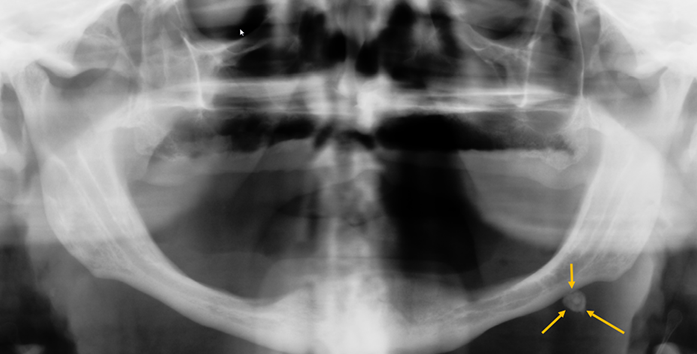 Klestadt (2) proposed that these cysts originated from epithelium between the maxillary and lateral nasal processes. These cysts are more common in fourth and fifth decades and have a strong female predilection (3, 4, 5). In the literature; nasolabial cysts have also been referred to as nasoalveolar cyst, nasal vestibular cyst, nasal wing cyst, maxillary cyst, subalar cyst and mucoid cyst of the nose (6, 7). Nasolabial cysts are mostly unilateral but there have been several instances of bilateral nasolabial cysts (1, 3, 4, 5, 7, 8, 9, 10). There has been a report which has suggested that this condition occurs relatively more commonly in African American females. 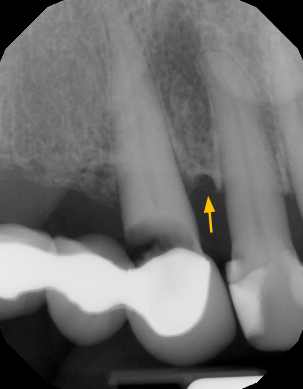 Periapical radiographs and Pantomographs do not typically show any evidence of abnormalities. 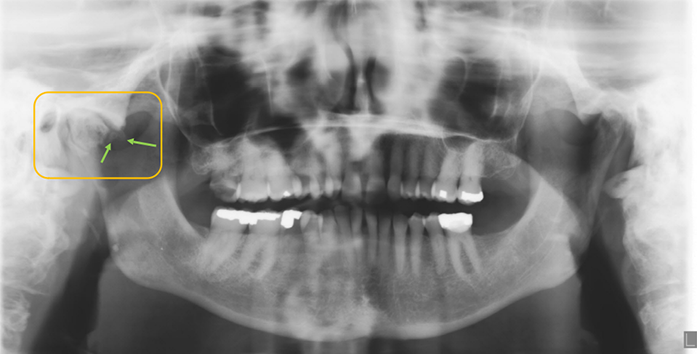 A modified lateral occlusal radiograph may show evidence of a swelling but is difficult to acquire when patients are in pain. CBCTs generally inherently lack the ability to visualize soft tissue and hence are not recommended. 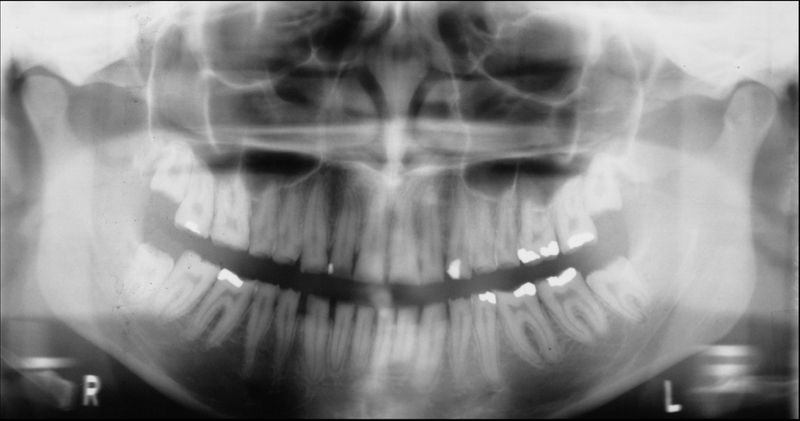 Multi detector CT images is the initial modality of choice to evaluate the extent of these lesions and to check if there is any bony involvement, which is evidenced by as a depression in the region of the frontal process of the maxilla. Other imaging modalities like MRI may be supplemented with CT images as these images help evaluate the adjacent soft tissues and to visualize the content within the cyst. The intensity of these lesions on MR images range from low signal intensity on T1 weighted images and are hyperintense on T2 weighted images. MRI images clearly show the extent of the lesion and may be an invaluable tool for evaluation of these cysts prior to surgery. In this case a MDCT was the initial imaging modality of choice and since the lesion was clearly evident on the MDCT with minimal bony involvement, no further imaging was requested by the surgery department prior to excision of the cyst. El-Din K, el-Hamd AA. Nasolabial cyst: a report of eight cases and review of literature. J laryngol Otol. 1999;113:747–749. Roed-Petersen B. Nasolabial cysts. 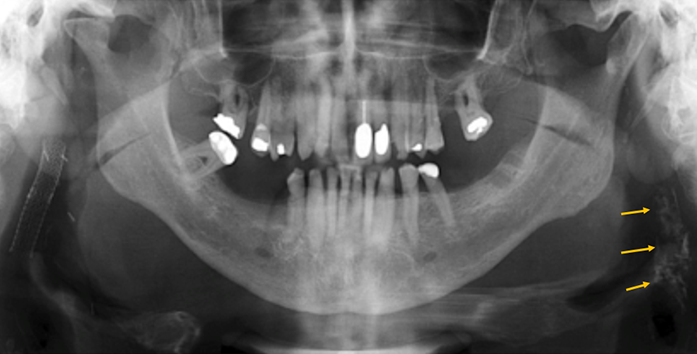 A presentation of five patients with a review of the literature. Br J Oral Surg. 1969;7:84–95. Kuriloff DB. The nasolabial cyst-nasal hamartoma. Otolaryngol Head Neck Surg. 1987;96:268–72. 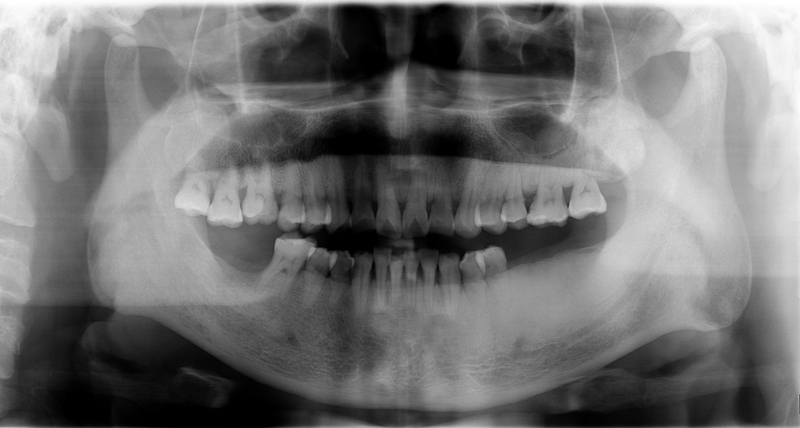 Sato, M, Morita K, Kabaswa Y, Harada H. Bilateral nasolabial cysts: a case report. Journal of Medical Case reports 2016 10:246 1990; 175:783–90. Venkatesh VK, Satelur K, Yerlagudda K. Nasolabial cysts—report of four cases including two bilateral occurrences and review of literature. Indian J Dent 2011;2:156–9..
Aquilino RN, Bazzo VJ, Faria RJA, Eid NLM, Bo´ scolo FN. 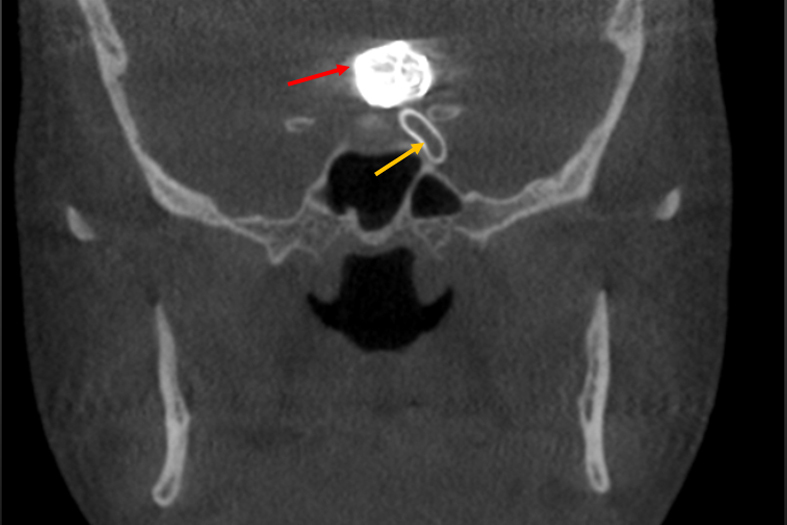 Nasolabial cyst: presentation of a clinical case with CT and MR images. Braz J Otorhinolaryngol 2008;74:467–71..
López-Ríos F, Lassaletta-Atienza L, Domingo-Carrasco C, Martinez-Tello FJ. Nasolabial cyst: report of a case with extensive apocrine change. Oral Surg Oral Med Oral Pathol Oral Radiol Endod. 1997;84:404–6. Vasconcelos RF, Souza PE, Mesquita RA. Retrospective analysis of 15 cases of nasolabial cyst. Quintessence Int. 1999;30:629–32.